How to get collector to know what to look for on altered and counterfeit coins. This is one of key dates in the Liberty Head Quarter collection & commanding a heavy premium in all highs & Lower Grades. This is a perfect candidate for altering to make high profit from another coin in the series. 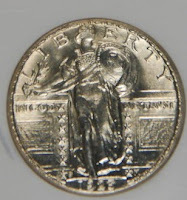 The 1928 s is a the most common coin used to to alter to make the 1923 s. The 8 in 1928, is changed to a 3 by removing the front of the 2 loops of the 8 . See this alteration by using the main focal point of this coin, the date. The top of an altered 1923 s would be rounded as the top part of the 8 looks before being altered. The original 3 would be flat. By using the same focal point, the date, we can see that the 1928 is recessed as the 1923 date is raised. It was nine years before the new recessed date was started. This was to stop the circulation wear which led to many dateless Coinscoins. 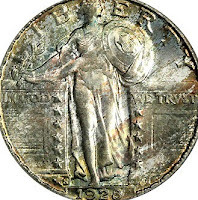 Read all about "pops How to detect altered and counterfeit coins by clicking here-All artictles on one site"
Visit this site by clicking here"
How To Detect Altered Coins "Three Legged Buffalo"